Virtual Reality and Virtual Learning Environments have become increasingly ambiguous terms in recent years because of essential elements facilitating a consistent environment for learners. Three-dimensional (3D) environments have the potential to position the learner within a meaningful context to a much greater extent than traditional interactive multimedia environments. The term 3D environment has been chosen to focus on a particular type of virtual environment that makes use of a 3D model. 3D models are very useful to make acquainted students with features of different shapes and objects, and can be particularly useful in teaching younger students different procedures and mechanisms for carrying out specific tasks. This chapter explains that 3D Virtual Reality is mature enough to be used for enhancing communication of ideas and concepts and stimulate the interest of students compared to 2D education. Distance learning is a re-invented method of education, rather than a new one. Distance learning is broader than e-Learning, as it covers both non-electronic (e.g. written correspondence) and technology-based delivering of learning. Technology-based learning is delivered via any technology, so it entails distance learning, too. Resource-based learning is the broadest term because any technology could be used as a resource in the learning process, where learners are active. In its early days, distance learning consisted of correspondence education, televised courses, collections of video tapes, and cassette recordings. Figure 1 shows a brief history of distance learning (Hamza-Lup & Stefan, 2007; Harper, et al., 2004). 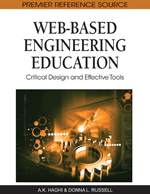 The concept of Internet-based learning is broader than Web-based learning (see Figure 2). The Web is only one of the Internet services that uses a unified document format (HTML), browsers, hypertext, and unified resource locator (URL) and is based on the HTTP protocol. The Internet is the biggest network in the world that is composed of thousands of interconnected computer networks (national, regional, commercial, and organizational). It offers many services not only Web, but also e-mail, file transfer facilities, etc. Hence, learning could be organized not only on the Web basis, but also for example, as a correspondence via email. Furthermore the Internet is based not only on the HTTP protocol, but on other proprietary protocols as well (Anohiina, 2005; Hamza-Lup & Stefan, 2007). Of particular interest is the growing number of students from developing or transitional economies studying Western university degrees. They enroll either as a foreign student at a Western university, or join an internationally accredited and qualified educational institution in their home country which collaborates with a Western university (Van Raaij & Schepers, 2008). Virtual Reality and Virtual Learning Environment have become increasingly ambiguous terms in recent years. The powerful 3D graphics hardware available in desktop computers provides an attractive opportunity for enhancing interaction. It may be possible to leverage human spatial capabilities by providing computer generated 3D scenes that better reflect the way we perceive our natural environment. 3D environments have the potential to position the learner within a meaningful context to a much greater extent than traditional interactive multimedia environments (Cockburn & Mckenzie, 2004; Dalgarno & Hedberg, 2001). In the last two decades collaborative virtual environments (CVEs) have been largely adopted to favor social interaction and learning. They offer the possibility to simulate the real world as it is or to create new worlds. Interacting with these environments, people can actively experiment situations useful for understanding concepts as well as learning to accomplish specific tasks. CVEs support independent viewpoints for users: they share the virtual environment to do highly synchronous collaborative work, manipulating the same virtual objects. Nevertheless, it is not an easy task to create such an environment.